Darkseid is still dead. Green Lantern tries to convince the Batman to relinquish the Mobius chair, but Batman refuses. Their discussion is interrupted when Batman becomes aware of Superman battling Wonder Woman. GL and Batman boom tube the scene, but Wonder Woman has things in hand, having used the lasso of truth to bring Superman to his senses. However, Batman alerts Superman that his cells cannot manage the energy of the solar pits, and he's going to die. Mister Miracle and company are able to break into Belle Reeve prison, but in doing so, a failsafe plan is activated by the Crime Syndicate. The plan is curtailed by the arrival of Owlman, who alerts Superwoman and Power Ring that they need to work with the Justice League, as the Anti-Monitor will require all of their efforts. Elsewhere, Grail informs Myrina Black that the Anti-Life Equation has a secret, and for some reason, Grail needs Steve Trevor, the first man to arrive on Paradise Island. Story - 3: It's the last act and The Darkseid War is still in first gear. The players are all over the place, none of the actions are contributory towards the plot, and worst of all, readers are treated to a plethora of retrogrades in terms of storylines. Superman and Wonder Woman are fighting, again. Superman is dying due to cells being overloaded, again. Cyborg has been coopted, again. Batman and Green Lantern... the picture is pretty clear. Big Barda is the fresh air in this story that genuinely needs something fresh and entertaining. The action is spread too thin and over too little area, for the result to be greater than what is delivered here. Readers are given a splash of the Anti-Monitor, Mobius, and that is all. The Anti-Monitor is the major antagonist and he's played a thimble's amount of worth in the action. Darkseid is dead, and he's the titular character of the storyline. The League has been transformed into New gods, and with the exception of Batman (surprise, surprise) there's been little development on what that means for the team. Flash, Shazam, even Superman, what does it mean with the exception of Superman dying... again. I'm pretty certain that The Darkseid War will read better as a trade, much as Forever Evil did, and the same for Trinity War. However, I don't bring up those storylines arbitrarily, as they were the building blocks for The Darkseid War. In truth, The Darkseid War has had nearly five years of building. It had been prefaced that Darkseid would return to Earth 0, and we were given a glimpse of the Anti-Monitor sometime after. Two of the DC Universe's biggest heavies, and the result has been fairly disjointed, which, as someone who enjoys Johns' work, is not easy to say. Much like his work on Infinite Crisis, where there was enough thrust for liftoff, there hasn't much more afterwards, and while the view has been pretty, it's unlikely you'll remember that as opposed to the memory of something that began with energetic efficiency, it's coasted for a dreadfully long time. Oh, if it wasn't being telegraphed already, someone is going to die, and that means the real death, unlike Darkseid's bait and switch. The best candidate is Steve Trevor, and Grail says she needs him, Wonder Woman still has feelings for him, and he's totally disappeared from view after being yoked aside by Superman last issue. It won't be the first time that Trevor has been killed off, but if it does happen, hopefully he'll be given the Blue Beetle treatment, and be shown as the competent person he is... which of course will beg the question, "Why kill him off, then?" The same was said about Blue Beetle. Art - 4: Fabok's Wonder Woman is excellent. I still prefer her classic outfit, but between her cingulum, gauntlets, greaves, and tresses, she looks efficient without sacrificing elegance... with Superman's negative outfit sans cape a close second. 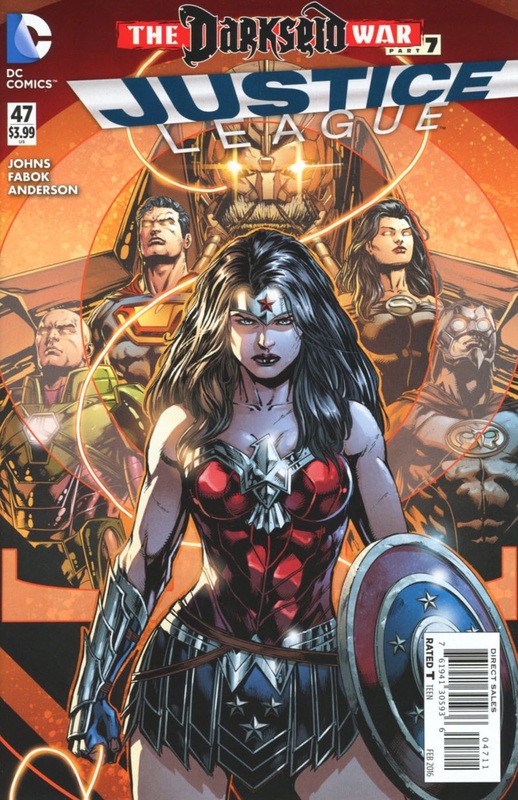 Cover Art - 5: Again, Fabok gives us a very impressive Diana.